Abortion rights activists chant outside the US Supreme Court ahead of a historic ruling Monday that struck down a Texas law that imposed strict requirements on clinics that perform abortions. 1. It's the first big win for supporters of abortion rights in a long time. The last time abortion-rights supporters were on the winning side of a big case at the Supreme Court was 16 years ago, when a 5-4 ruling in Stenberg v. Carhart struck down a Nebraska law banning a specific procedure abortion opponents called "partial birth abortion." That win was effectively reversed in 2007, however, when the court upheld a similar federal law banning the same procedure, also on a 5-4 ruling, in Gonzales v. Carhart. The substance hadn't changed much, but the replacement of Justice Sandra Day O'Connor with Justice Samuel Alito in 2006 gave abortion opponents an extra vote, which was enough to change the outcome. After Monday's decision, many foes of abortion rights complained that there were few restrictions on abortion that would pass muster with the high court. But, in fact, in the years since the court first legalized abortion nationwide in Roe v. Wade in 1973, about half the major cases have been clear wins for abortion opponents, including upholding state laws requiring parental involvement for minors, waiting periods, and bans on the use of public funds to pay for abortions. 2. It could put pro-abortion rights forces on the offensive. Since Republicans took over Congress and most state legislatures after the 2010 elections, states have enacted nearly 300 separate abortion restrictions; the most in any five-year period since Roe v. Wade was decided. Many of those were the same types of laws claiming protections for women's health that were struck down by the Supreme Court this week. Those laws include requiring doctors who perform abortions to have admitting privileges at a nearby hospital and requiring abortion clinics to meet the standards of facilities performing more involved surgical procedures. The justices have already responded to petitions from some states with similar laws. Just a day after handing down the Texas ruling, they rejected appeals from Mississippi and Wisconsin, where physician admitting privilege laws had been blocked by lower court judges. Those laws are now permanently blocked. Officials in Alabama also dropped their defense of a similar law. But the decision doesn't automatically invalidate similar laws in other states because the effect of such statutes is different in every community. For example, what may amount to an "undue burden" in Texas because of the sheer size of the state might not be as burdensome in states with clinics closer together. In states where lower court judges have already blocked laws, those blocks are almost certain to remain in place. But in other states opponents of the restrictions would have to work to overturn each law individually. They say that is what they plan to do. "We will now will take this fight state by state to challenge and repeal laws all across the country," Planned Parenthood President Cecile Richards told reporters in a conference call immediately after the ruling. Planned Parenthood announced on Thursday that it would pursue efforts to block or repeal similar laws in eight states: Arizona, Florida, Michigan, Missouri, Pennsylvania, Tennessee, Texas, and Virginia. Abortion-rights supporters are also taking aim at some long-standing abortion restrictions in federal law. The draft Democratic platform that will be finalized at the party's nominating convention in late July includes a plan calling for the repeal of the Hyde Amendment, which has banned most federal abortion funding since 1977. That provision was highlighted and praised by presumptive nominee Hillary Clinton's campaign, noting that it represents the first time such an explicit vow has been included. 3. Opponents of abortion rights aren't likely to retreat. While the latest Supreme Court ruling was definitely a setback for abortion foes, they are not giving up. For one thing, opponents remain in control of a majority of state legislatures and governorships, and that's unlikely to change following this year's national elections. "Americans United for Life will continue to fight — in legislatures and in the courts — to protect women from a dangerous and greedy abortion industry," said AUL Acting President and Senior Counsel Clarke Forsythe. Americans United for Life has been at the forefront of developing model laws restricting access to abortion. The movement against abortion rights has a much larger menu to choose from than the two issues the high court addressed. For example, many states (including Texas) have passed or are considering bans on abortion after roughly 20 weeks of pregnancy. Many of those bans are being challenged in the courts but none has yet reached the Supreme Court. Other restrictions include requiring pregnant women to have ultrasounds before an abortion, to make multiple visits to an abortion provider and banning the use of telemedicine for medical (as opposed to surgical) abortions using the abortion pill mifepristone. 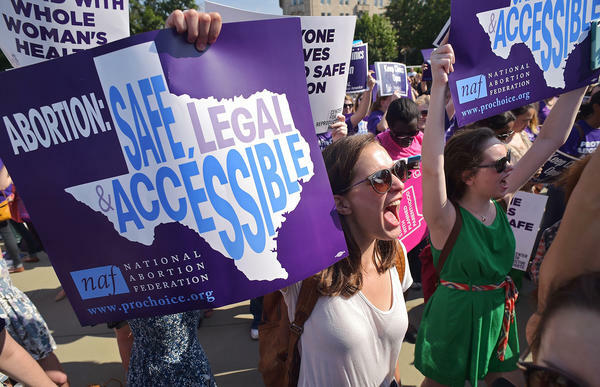 Abortion opponents say they aren't giving up on pursuing health and safety standards like the ones struck down in Texas, either. "This issue of safety standards is not over," said Marilyn Musgrave, vice president of government affairs at Susan B. Anthony List. Even some similar laws could pass muster if they are crafted carefully enough, said Kristi Hamrick, a spokeswoman for Americans United for Life. "We don't have a one-size-fits-all bill to send to the 50 states," she said. "The law is specific and so the tools must be too." 4. The decision could shake up national politics. Both sides in the long-polarized abortion debate are already pointing to the case in an effort to mobilize their supporters. "This certainly makes the November presidential election even more critical," said Musgrave of the Susan B. Anthony List. "It is so obvious that we need to elect a pro-life president." On the opposite side, Ilyse Hogue, president of NARAL Pro-Choice America, says the decision "underscores what the election means for Supreme Court jurisprudence." With one vacancy already on the court and others likely in the next four years, she said, "reproductive freedom is very much on the ballot this November." Hillary Clinton's campaign hailed the decision. "We need a president who will defend women's health and rights and appoint Supreme Court justices who recognize Roe v. Wade as settled law," said a statement from the candidate. And while presumptive GOP nominee Donald Trump's campaign was silent on the issue in the immediate aftermath of the decision, Musgrave said abortion opponents are confident he is on their side. "Say what you will about Donald Trump, his commitment to nominate pro-life justices — I've never seen another candidate do that," she said. 5. Younger generation will have a lot to say about the future of abortion rights. Among the many things the two sides in the abortion debate disagree about is how the younger generation feels about abortion. Polls tend to differ dramatically depending on how the question is asked. Musgrave says, "Our polling shows more and more millennials are pro-life, particularly when you look at things like 20-week (abortion) bans." But Dawn Laguens, executive vice president of Planned Parenthood, says they are seeing the exact opposite — that younger women are more supportive of abortion rights. "They're so social justice oriented," she said. And Laguens says that coming demographic changes, including a more diverse electorate that could tilt Democratic, are a main reason for the recent spike in anti-abortion legislating. "They feel it slipping away," she said. "They can see the demographics, too, and they want to lock this stuff in."